ww2dbaseBoleslaw Bronislaw Duch served as a junior officer in the Polish Legions, which was later absorbed into the Russian Army, during WW1. He served in the Polish Army after Poland gained independence. He was promoted to the rank of major in 1924 and lieutenant colonel in 1929. Between 1935 and 1938, he commanded the 73rd Infantry Regiment. In 1938, he was promoted to the rank of colonel. When the European War began with the German invasion of his home country, he was the the acting commanding officer of 39th Reserve Infantry Division (General Bruno Olbrycht was suffering from health issues). After the collapse of the Polish military at the face of the German-Soviet joint invasion, he was able to escape the country, eventually making his way to France, where he, at the rank of brigadier, led the Polish 1st Grenadier Division in the failed defense of France in 1940. Escaping to Britain, he commanded the Polish 1st Rifle Brigade in Scotland, United Kingdom between 1942 and 1943, and then the 3rd Carpathian Infantry Division beginning in 1943. With the latter division, he fought in Italy. He was promoted to the rank of major general in 1945. In 1947, he retired from the military and resided in London, England, United Kingdom. In his retirement, he served as the chairman of the Council of the World Polish Veterans' Association. 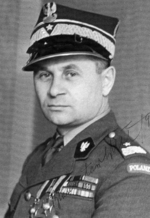 In Feb 1980, at the age of 95, he was named the General Inspector of the Armed Forces of Poland. He passed away in Oct 1980. He was buried at the Polish War Cemetery in Monte Cassino, Italy. 15 Nov 1885 Boleslaw Duch was born in the Poland region of the Russian Empire. 1 Jun 1945 Boleslaw Duch was awarded Knight's Cross of the Virtuti Militari. 9 Oct 1980 Boleslaw Duch passed away.